A new little Food Byte video for you to watch and share! This was so much fun to make and I just love it. I hope you will too! Last weekend we spent a very happy Sunday cooking up and filming lots of delicious dishes for you to watch and cook so watch this space for more mouthwatering Food Bytes to come! This recipe for a simple but ever so delicious watercress soup is perfect for banishing the winter blues. The soup is packed full of goodness and full of the peppery fire of watercress. Imagine coming in from the cold to a big warming bowl of soup with a still warm from the oven scone, butter melting and ready to dunk. This is the perfect little dish for a mid week lunch and great to pack into a thermos for a blustery winter walk. It also makes a great starter when you have friends round for the weekend. You can make the base of the soup well in advance, just adding the watercress at the end so it keeps its vibrancy and pep. The scones can be made in advance too, just warm them through in a low oven just before you serve. Start your soup. Heat the oil and butter in a pan and fry gently for 10 minutes until softened. Add the potatoes and the stock cube then pour over the boiling water. season well and simmer for 10-12 minutes until the potatoes are tender. Meanwhile, make the scones. Sift the flour into a bowl and add the salt, baking powder, paprika and mustard powders. Add the butter and rub together with your fingers as you would when making pastry, until it has been incorporated. Stir in the cheeses and chives and plenty of black pepper then pour in enough milk to bring together into a soft but not sticky dough. Knead briefly then pat into a round 2.5-3cm thick. Cut out scones with a 5cm cutter, re shaping the trimmings to get as many as possible. place on a baking sheet dusted with flour then brush with milk. Bake for 10-12 minutes until golden and risen. Once the potato is tender, add the peas and watercress to the pan. Whiz with a stick blender until smooth. 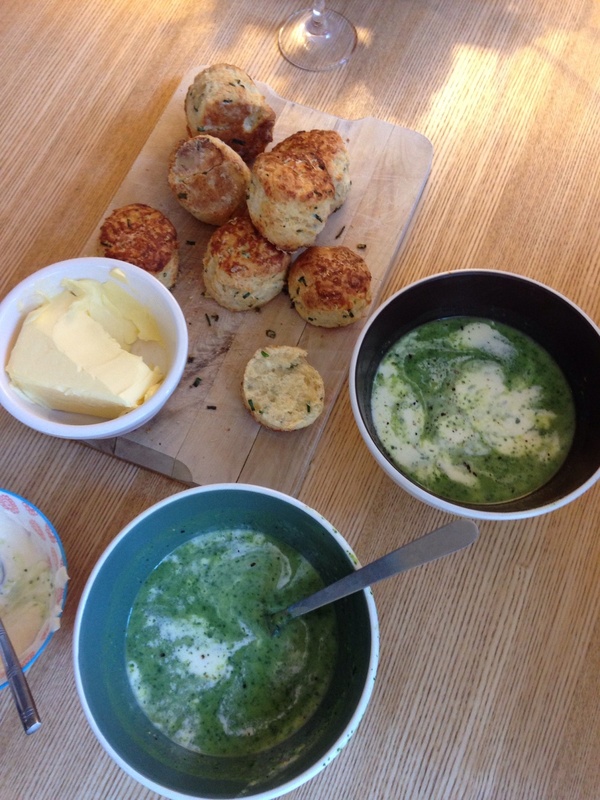 Ladle into bowls and serve with a dollop of creme fraiche and the warm scones with lots of butter.